Experience the quality and versatility of a Nema Enclosures stainless steel electrical enclosure firsthand – right in your office. Nema Enclosures design, customize and fabricate quality UL rated stainless steel or aluminum electrical and instrument enclosures to your exact specifications and that meet your lead times. We strive to give you a competitive advantage by providing you with unmatched product quality and customer service. Choose either a standard or a custom stainless steel, or aluminum, enclosure built to your specifications. You can customize it further with silk screening or engraving with your company logo or important safety information. Nema Enclosures builds various types of electrical enclosures – wall mount, free-standing, floor mount, JIC and trough. We also custom build almost any size electrical enclosure to your print. Unlike most electrical enclosures, Nema Enclosures products feature an adjustable swing outdoor assembly to provide you with the space you need inside and outside your enclosure to fit your valuable equipment. Enclosure doors can be solid metal, feature a window, and have cutouts or mounting holes – whatever you need. Choose between clamps, 3 point latches, ¼ turn handles, and lock options for the level of security you require. Enclosures feature seal options – strip, die-cut, and bulb extrusion – to protect your equipment inside. Pem studs and pem nuts can be placed on your enclosure’s back panel where you need them so you don’t have to drill and tap your own mounting holes – saving you time and money. Gland plates, thru holes and custom cut outs can be placed on side, top or bottom of a Nema Enclosures electrical enclosure where required giving you total flexibility in mounting devices on the enclosure. Give us a call at 713-921-2233 or email us and we’ll bring it out to your office with us when we visit you. 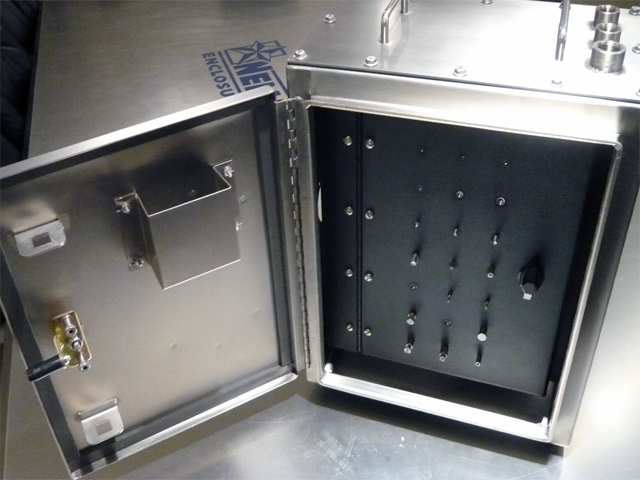 The Nema Enclosures stainless steel electrical enclosure demo model features various hinge, latch, cutout, insulation, and lock options. At Nema Enclosures we fabricate high quality custom and standard electrical enclosures for the oil and gas, petrochemical, variable speed drive/variable frequency drive, wastewater management, chemical, transportation, telecom, power generation, water treatment, food and beverage, and fire protection industries. 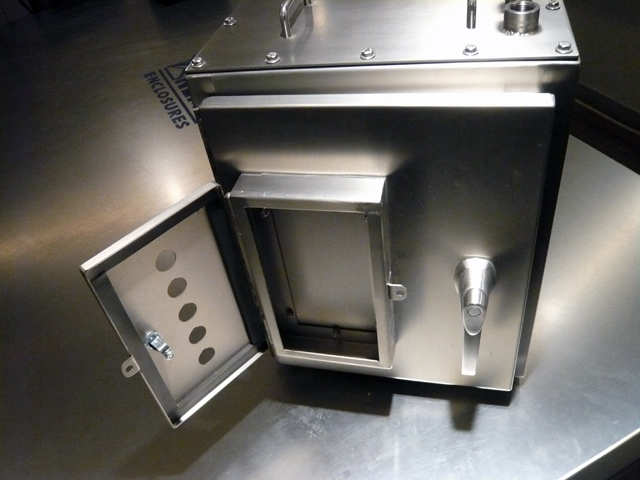 Our enclosures are built using stainless steel Type 304L and 316L, and 5052 aluminum. Type 304L stainless steel is excellent for general outdoor us because of its corrosion resistance qualities. Type 316L stainless steel is well suited for use in extreme weather conditions, like those experienced in the oil and gas market, due to its superior corrosion resistance qualities. Aluminum is a versatile material that can be used for enclosures in a variety of industries. We can provide third-party certification from UL, C-UL, IEC or NEMA. Custom enclosure jobs are handled by a dedicated project manager and quality assurance team and can be completed in as little as 10 days. At Nema Enclosures we design quality into everything we do and make sure it’s clearly communicated to everyone involved in the manufacturing process. Due to the custom nature of our business, Nema Enclosures has a stringent quality control process and with it we have been extremely successful in delivering our highest quality electrical enclosures to our customers. This is critical because most of what we fabricate is incorporated into products built by our customers for their customers. It means our customers depend on us for quality components. Their reputation depends on it – and ultimately, so does ours. That’s why we encourage our customers to visit us in our shop at any time to view their order firsthand – at any point during our manufacturing process. We believe it is only through the establishment of clear qualifications, responsibilities, documentation, and communication requirements for quality control on any electrical enclosure, that the full benefit of the total quality management process can be realized. Benefits can include avoiding duplication of documentation and inspection, reduction of misunderstanding between stakeholders, real or perceived under or over inspection, and most importantly, long lasting protection of the final product and company reputation. We strive for this in every electrical enclosure we build. Only then are we satisfied. You don’t have to take our word for it. Contact us and we’ll bring our stainless steel electrical enclosure out to you so you can see our quality for yourself. Only then can you be satisfied.